This page contains my musings on Report on a Shopping Trip to Yokohama, by Ashinano Hitoshi, after reading the Acclimate translation. In Japanese the title is Yokohama Kaidashi Kikou. It takes place in what could be a post-Blue Submarine No. 6 world. The seas have risen and swamped coastal cities. The remaining cities seem mostly to be in ruins and the population is greatly diminished. There is a reference in one story to a "First Wave." There appears to be a still functioning society with a money economy and some technology. We know of three very advanced robots and there is motor transportation. There may have been a time of chaos, since the two robots we meet are initially equipped with guns, but by the time of the story the guns are only a formality for the most part. There seems to be little or no threat of violence in any of the stories. However, we learn eventually that it is a dying world. There is a giant Rutan-like plane that keeps passing overhead. The people on the ground say that it can't land anymore. In the plane we meet another Alpha, the captain, and an old cleaning lady. The plane seems to contain a large library and the captain spends all of her time gazing through the windows of a gallery at the earth below. She comments in one panel how another village has disappeared. In other scenes Alpha, the one on the ground, visits the beach and comments on how at one time a lot of people came there, but now there is no one except the robots to visit it. At least mankind seems to be dying with some dignity in this story. The title comes from the occasional need for Alpha, the main character, to make coffee bean supply runs to what passes for Yokohama these days. The old Yokohama is under water now, and the water level is still rising. There must have been a superior technology in existence before the cataclysm since the lights still work in the skyscrapers even though their foundations are under water. Our power grid wouldn't still be functioning under such conditions. In the new Yokohoma there's still a bustle of people (robots?) and most any kind of small goods is available for purchase. The fact that a money economy is in existence implies that there must be a high level of social stability, as does the obsolescence of a need for side arms. Alpha can buy coffee beans in the Yokohama marketplace as well as a new blouse. Later she and Kokone obtain swim suits and Alpha obtains a kimono somehow. Alpha is a very human-like bio-mechanical robot, but we soon learn that her skin and hair are very artificial. Alpha knows that she is a robot and is very happy to be one. She is in a very Waiting for Godot-like situation, with an owner who is gone and whose return she is awaiting. Alpha runs a remote cafe, Cafe Alpha, of course, which has almost no customers. Humans do exist, such as the enigmatic old man who runs a gas station near the cafe. There are also a little boy and girl who show up, but they don't appear to have parents. Running water and electricity are still available, and Alpha does travel on a Vespa-like motor scooter that is gas powered. Alpha cannot metabolize animal protein, but she seems to eat food for energy. When some of the locals talk Alpha into trying alcohol at a festival, she dances through the night. Alpha does not have memories of her earliest times, but she slowly starts to regain them. Alpha's world is definitely postindustrial, and reminds me of the world of Poul Anderson's No Truce with Kings. Technology still survives on an artisan level, and there is no mass production or large scale energy production, even if there is gasoline. On the other hand, the remaining civilization may just be living off their stores. Will Sensei run out of parts with which she can repair Alpha? The society appears to be too stable for there to be large scale lack of goods and supplies. From the water melon incident we know that the locals are raising vegetables locally and even seem to be able to create a surplus. Coffee beans, which probably have to be imported, are still available, and it's doubtful that they would have lasted this long. There seems to be no need for a Mad Max to right the wrongs of this world. Alpha's biggest problem seems to be making her supply runs to Yokohama. Until the storm destroys the cafe, she seems to be able to maintain what little infrastructure she has, which includes running water. Clothes are still being made and there are still children. Hopefully the waters will stop rising after a certain point. It'd be very sad to have just Alpha and Kokone left alone on the last little bit of dry land waiting for the end. The robots do appear to have a multipurpose data port in their mouths. Alpha connects a digital camera directly to her mind (CPU?) via the port. The Doctor (Sensei) also uses Alpha as a controller for her experimental hydroplane when she decides to give the device a decent burial by sending it out to sea. Alpha has a virtual reality type experience when she takes hydroplane out for its burial run, and later when she flies in a plane. The doctor built the hydroplane vehicle when she was young to try to reestablish communications with the other side of the bay. Captain Alpha is probably the control unit for the plane she flies in. Kokone is a later model robot who works for a delivery service. Unlike Alpha, Kokone was originally programmed to try to be as much like a human as possible. Also unlike Alpha, Kokone can digest animal protein. Kokone says it's because of her software and she offers the software to Alpha, who apparently doesn't take her up on the offer. Kokone also goes by a human name instead of her robot designation. After meeting Alpha, Kokone becomes more aware of her robotness and begins a search for her roots. She starts looking for books on the A7 series in libraries both still in use and abandoned. During their first encounter Kokone delivers a message to Alpha from her owner by directly joining their data ports together. This looks highly suggestive and does apparently have an emotional impact for the robots. Alpha passes out after this encounter. The message was apparently encrypted so that Kokone didn't know what it was even though she was carrying it internally. Kokone is also the one who delivers the digital camera, a present from "owner" to Alpha. After Alpha receives the camera she becomes an avid photographer, carrying the camera around instead of her gun. The camera uses external data cubes and has the same kind of optics for a lens that the robots use for eyes. Kokone and Alpha (as well as Captain Alpha) look similar, but have different colored hair and Kokone wears hers in a pageboy while Alpha wears hers long. Alpha has green hair while Kokone's seems to be a shade of lavender or magenta. Alpha has lavender or purple eyes. I haven't seen a color plate of the Captain, yet. They're always dressed very conservatively and modestly, and Alpha's trademark is her bolero style vest and pillbox hat. They have basically Barbie Doll proportions, especially judging from my vinyl doll of Alpha. That is, they are very leggy and feminine, but wholesome looking. They'd fit right in with Belldandy. I sometimes get the impression that Alpha is taller than Kokone, but I'm not sure. Apparently discerning humans, such as the Old Man, can readily identify them as robots. Alpha is basically a child, which is probably why she relates to Takahiro so well. We never see her get really mad. She approaches the world with wide-eyed amazement and appreciation, and is happy with her existence, at least until the destruction of her cafe. In contrast, Captain Alpha appears much more mature and world-weary and there seems to be a sadness about her. Kokone initially gets around by hitchhiking and walking, but she eventually buys a scooter that looks like Alpha's, but Kokone's is electric. Alpha and Kokone become good friends and Kokone, who actually has vacations, visits Alpha's place and stays over. Alpha also visits Kokone in the city, or what passes for a city in their time. Like Alpha, Kokone can swim (unlike Nuku-Nuku) and enjoys doing so. Apparently some humans have oral data ports, or else there are more robots because Kokone delivers a software message to one of her customers besides Alpha. Kokone doesn't appear to have an owner, unlike Alpha, and lives pretty much like an independent human, with a job and home, and holidays. We know from the Doctor that there are at least three A7 robots. Alpha is the A7M2 model while Kokone is a more advanced A7M3. The A7M1 may be the captain of the mysterious airship. Curiously, during World War II Mitsubishi built the A7M1, A7M2, and A7M3 prototypes of the plane that was supposed to replace the famed Zero. This plane was called the Reppu, or Hurricane. From Kokone we learn that there were earlier series of robots, such as A6s (the Zero!) but she has trouble finding any information on them. There is a powerful scene in which she goes through the children's books in an abandoned nursery school but finally finds only an old analog record (vinyl?) about robots that she can't play. Probably the biggest mystery of the series is the origin of the robots and the role they play in this dying world. We know from the Captain Alpha of the airship that they're capable of far more than running a cafe or delivering packages and messages. The Doctor gives us some hints of what Alpha's processing power when she uses Alpha as a controller for the hydroplane. Later scenes with airplanes and Alpha's flying may imply that there is something to this airplane connection. Later on in the series another a couple robots are introduced. The character with a data port does turn out to be another robot, Maruko, and she becomes rather possessive of Kokone, and tries to taunt Alpha, apparently thinking there is some sort of love triangle. Alpha, of course, would just like to be friends with Maruko. Maruko has a part time job as a delivery driver for a stationery store. When Alpha embarks on her Wanderjahr after her cafe is destroyed in a storm, she happens upon one of the few male robots in the story, or in her world. Apparently there wasn't a very high yield rate for males. This one is a pilot of a single engine radial piston engine plane. He eventually does a fly-over of the cafe. The people in this world include the children Takahiro and Makki. Alpha is very affectionate towards the boy Takahiro. Makki, the little girl, puts off meeting Alpha until Chapter 45 (Book 6). It turns out that Makki was jealous of Alpha's affection for Takahiro. Alpha tells Makki that Makki and Takahiro are on the same ship (same generation) and she feels that she is just watching from the shore. They are the same age so they can be together "forever." This contrasts with Alpha's comment in the original Prologue that she's happy that she's a robot so she can wait for her owner forever. There is a scene in which Alpha and Takahiro take a bath together . Takahiro is obviously uncomfortable with the situation, but it is more like the bath scene in Totoro than anything suggestive. As the story progresses, the children grow up and become teenagers. Other important characters are the Sensei (Doctor) and Ojisan (the Old Man). In fact, some of the chapters are flashbacks to when the pair were young together. Sensei was still a young girl and robotics researcher right after the big disaster happened. Sensei is a roboticist and seems to know a lot about the Alpha series of robots. There are also a couple of mysterious friends in a photo of Sensei as a schoolgirl. There is also a naked water sprite, Misago, with fangs who only visits children. She develops an interesting Takahiro. There is a wanderer with a strange flying fish creature as a pet. This man, Ayase, apparently grew up in the neighborhood of the cafe and has the same accent as the Old Man. These last two characters take Yokohama from the realm of hard science fiction to the fantastical. Misago appears to be immortal. Now that the world of science and reason is dying out, perhaps the creatures of myth and legend are returning to the land of Japan. Perhaps Misago is just another robot. I finally got a native Japanese speaker to explain the title in more detail. It really is more like Travelogue Reporting a Commercial Purchasing Trip to Yokohama. The series ended at 14 TPBs (tankoubons) plus an epilogue in Afternoon. http://ykk.misago.org/Contents for the earlier chapters. 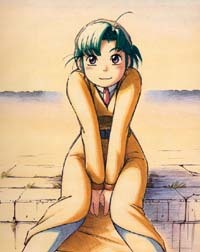 A lot of YKK/YST readers also seem to like Aqua/Aria, which is available as both manga and anime. Part of the manga was originally released by ADV, and is now being reissued by Tokyo Pop, starting with Aqua. All of the YST art is property of Afternoon and Ashinano Hitoshi as far as I know. Please go and buy the manga and support YST. It's easy to buy in the US over the internet or by ordering through Asahiya bookstores.